These are still the old Quebec shields, before the grand renumbering. 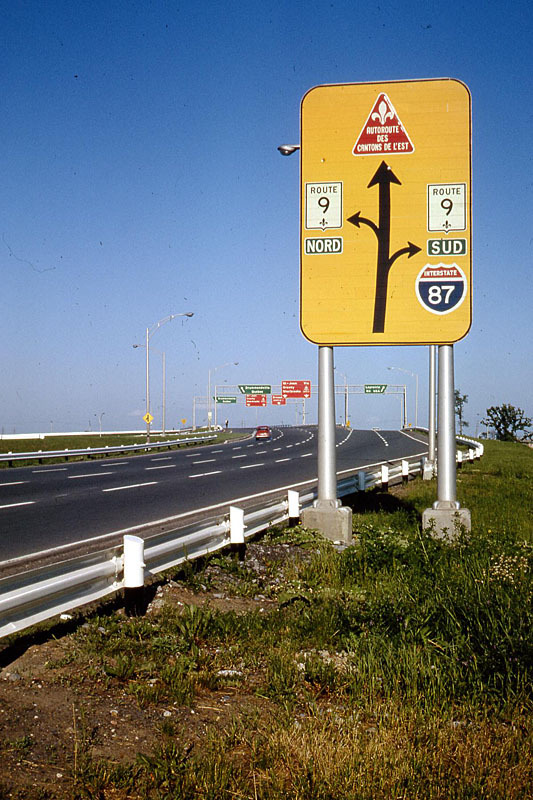 What is now Autoroute 10, was still the Autoroute des Cantons de L�est, and its shield was a red triangle. What really fascinated me was that the guide signs specific to that route in the distance were also red. I know that other toll autoroutes had a similar triangular shield in different colors, including blue and green (BGS, BBS and BRS � sheesh!). Would those guide signs be matched to the toll road color? Of course an Interstate shield in Canada is always something special. Photo by Jim Lindsay, 6/18/1966. Click here to browse through the Quebec selection of our catalog of historic signs!